In 1988 the Energizer Bunny made its first appearance on television. This marketing icon of Energizer Batteries was a pink toy rabbit wearing sunglasses that beat a drum bearing the Energizer logo. The idea behind the mascot was that being powered by Energizer batteries, it was unstoppable. Turning to today, we are seeing a reincarnation of this Energizer Bunny in the form of the S&P 500, a broad measure of U.S. stock market performance. 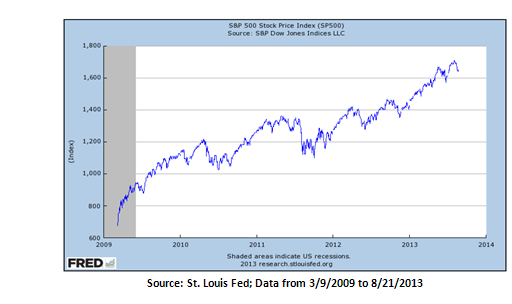 As seen below, this Energizer Stock Market has been on a nearly unstoppable tear since March 9, 2009. In its heyday, the Energizer Bunny kept on beating its drum despite facing villains of all shapes and sizes â€“ Darth Vader, The Wicked Witch of the West, Dracula, King Kong, Wile E. Coyote, and Boris and Natasha. With a classic Hollywood ending, the Energizer Bunny frustrated its rivals by outlasting their attempts â€“ many villains collapsed from exhaustion, the sun came out before Dracula could seek shelter, or a fire sprinkler was inadvertently triggered causing The Wicked Witch of the West to melt. Today, this Energizer Stock Market keeps on beating its own drum despite facing villains of a different sort. Market villains such as rising interest rates, higher oil prices, mixed Chinese economic data, Fed comments regarding â€œtapering,â€쳌 increasing worldwide geopolitical risk, slowing corporate earnings, and the continued crisis in Europe, have failed to deter the S&P 500 from continuing one of its longest bull markets since World War II. Bond market uncertainty as investors struggle with the implications of a possible end to QE. Renewed disagreements in Washington about fiscal policy. Fiscal tightening, especially at the state and local level, will continue to be a drag on growth. Despite these market villains, we are not expecting a sharp market decline. There are plenty of market â€œheroesâ€쳌 out there that may counteract these villains. These include improving labor and housing markets, a spending consumer, still historically low interest rates, and improved corporate and personal balance sheets. However, with that said every battery, even Energizer batteries, will eventually slow down or come to a complete stop. We are not bearish per say, however, a market slow down or a complete stop in our opinion would most likely be characterized by muted market returns accompanied by increased market volatility. In this market environment, we continue to stress conservative investing, increased diversification, and a bias toward income producing investments, such as dividends and fixed income spread product (i.e. corporate bonds).